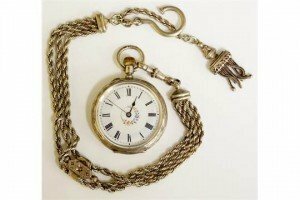 A Continental silver fob watch with foliate engraved case the back with vacant cartouche the dial with pale blue chapter ring and Arabic numerals, the centre floral decorated. 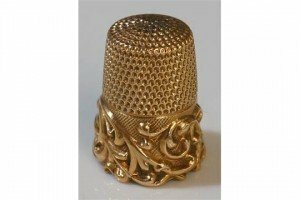 A 9ct gold thimble with scrolling foliate design in relief below, inscribed internally with the letters ‘MKD’. 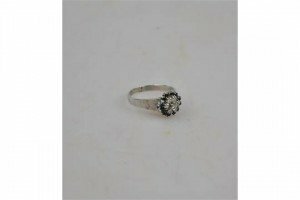 A sapphire and diamond cluster ring, the seven eight-cut diamonds surrounded by dark blue sapphire in white metal setting stamped 18ct. 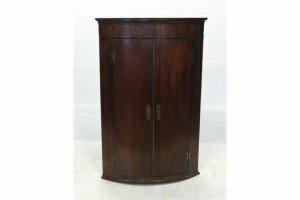 A Georgian mahogany bow front corner cupboard, with boxwood and ebonized line inlay to the frieze, having two doors opening to reveal three shelves, fitted with a short drawer. 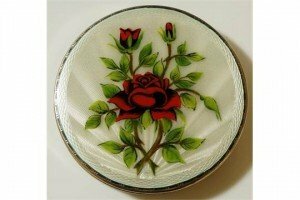 A silver compact, enamel over engine turned sunburst design with hand painted red rose above, internal mirror to lid, engine turned detailing to base, interior marked Birmingham 1961. 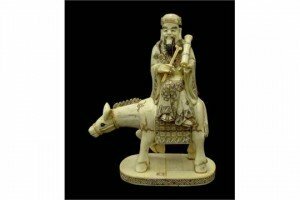 Chinese carved bone okimono of a sage on the back of a donkey, with polychrome highlights, calligraphy signature to base. 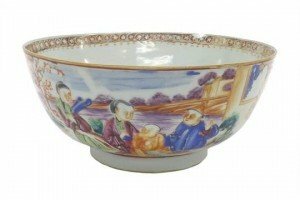 A Canton porcelain pedestal bowl painted with various figures in an exterior landscape within orange fretwork panels decorated with birds and flat foliage. 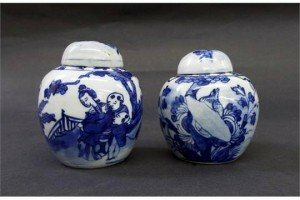 A pair of Chinese blue and white porcelain ginger jars and covers, one decorated with three figures in an exterior setting, the other with an exotic bird in a tree. 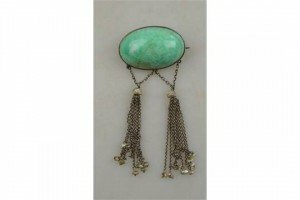 An Arts & Crafts green stone cabochon brooch having two suspended tassels with river pearl terminations. 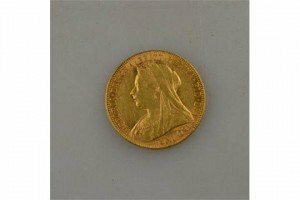 A Victorian gold sovereign 1899. 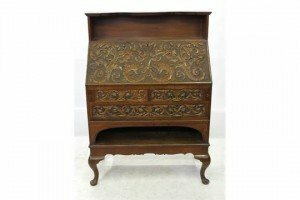 An ornately carved Edwardian oak bureau, with shelf rack over the drop flap, fitted two short drawers over one long drawer, with a shelf below, the whole carved with dolphins, acanthus and vine. 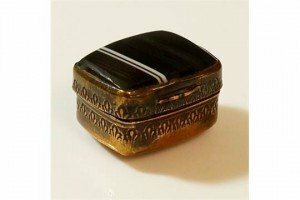 An agate and brass vinaigrette, banded brown and white agate to lid, banded red and white agate to base, both mounted in brass with decorated borders. 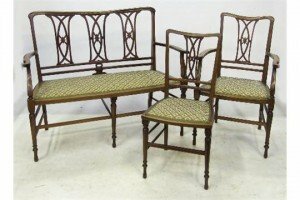 An Edwardian mahogany part salon suite, comprising chair back settee, an open armchair, and three single chairs, all with harebell decoration and boxwood line inlay. 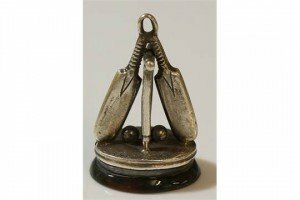 An unusual silver fob in the shape of two cricket bats leaning against a stump with cricket balls beneath, surrounded by engraved foliate border, smooth green hard stone with red flecks to base. 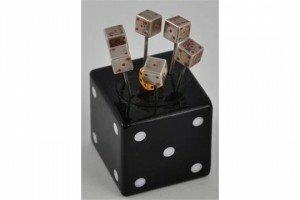 A set of silver and composition dice shaped cocktail sticks with red enamel numbers. 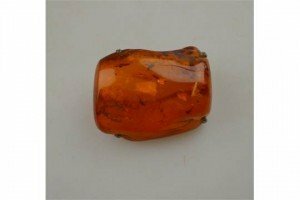 A large specimen of amber in four-claw brooch mount containing at least six various insects. 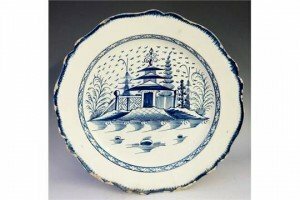 A large tin glazed pottery plate painted in under glaze blue to the centre with a Chinese temple in stylised landscape, formal hatched border and blue rim. 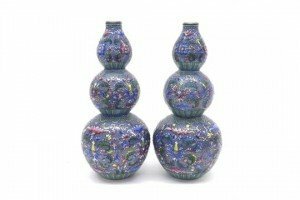 A pair of Chinese porcelain double gourd vases, decorated with various scrolled foliage upon a violet ground. 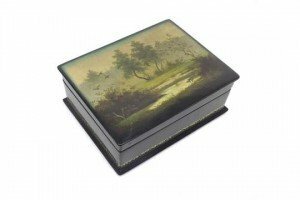 A Russian style lacquered box, the lid painted with a riverside landscape with ducks and red interior. 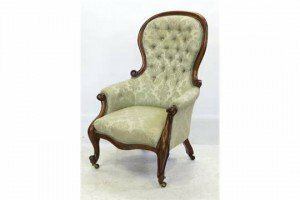 A Victorian mahogany show wood armchair, with buttoned spoon back, raised on front cabriole legs.